Like many other towns around the country, the retail center of Sharon, Pennsylvania used to be downtown. The shift away from downtown began in 1953 for Sharon, when the Hickory Plaza was built in Hickory Township. That shopping center would go on to be renamed as Hermitage Towne Plaza in later years. It wouldn't be until the late 1960s that the Shenango Valley Mall was built. The 514,000 square foot enclosed mall was developed by the Crown American Corporation. The mall was opened with JCPenney (163,000 square feet), Sears (105,000 square feet), and W.T. Grant (76,000 square feet) as anchors. 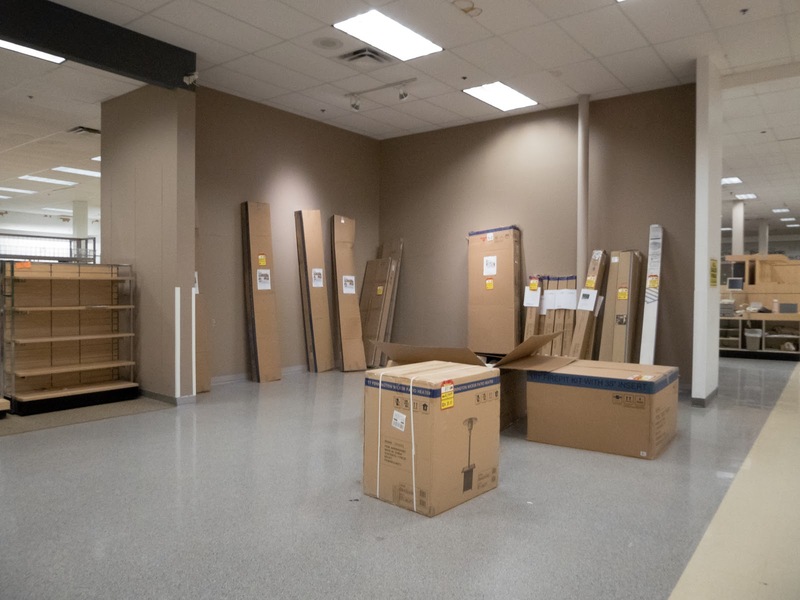 Sears and JCPenney both relocated from downtown Sharon. Hickory Township grew in population after the growth of retail in the area. On January 2, 1976, Hickory Township became the city of Hermitage. In Fall 1976, a Strouss department store opened in the former W.T. Grant location. It made Strouss' 11th location. 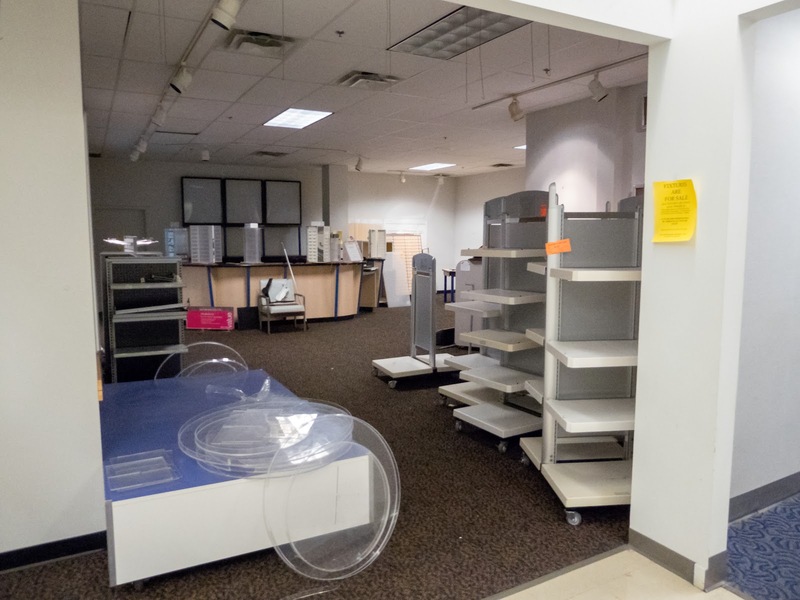 Strouss also had a store in downtown Sharon that closed around the time the Shenango Valley Mall location opened. That store is now "The Winner". In 1986, the Strouss moniker was retired in favor of Kaufmann's. In 2006, Kaufmann's was changed to Macy's after May department stores were sold to Federated department stores. 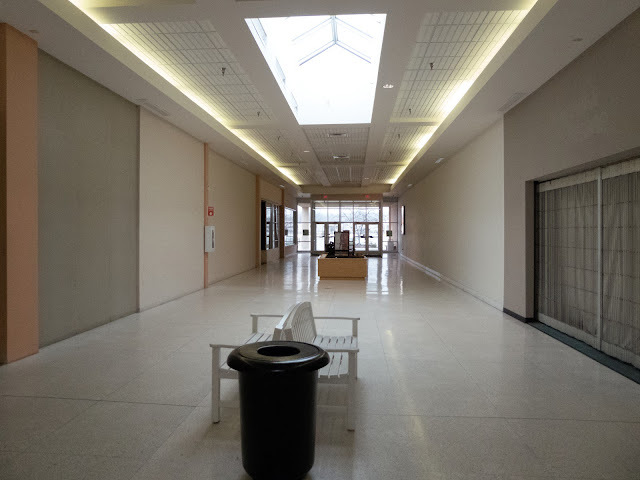 A small north wing of the mall was closed in 1997 during a renovation. 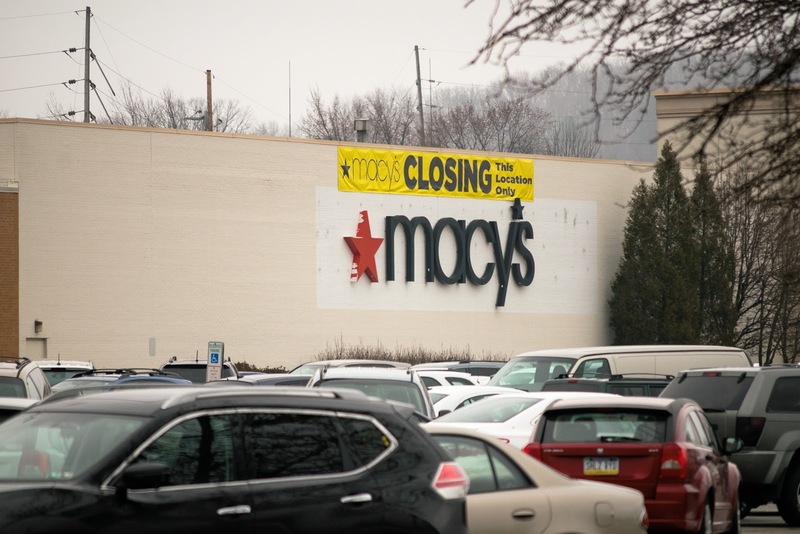 On January 4th, 2017 the Shenango Valley Mall took a major hit when both Macy's and Sears announced that their stores were closing. The mall would be losing two of its three anchor stores at the same time. On March 26th, both stores closed for good. Luckily, the JCPenney store was spared from being closed when that company announced they were closing stores. 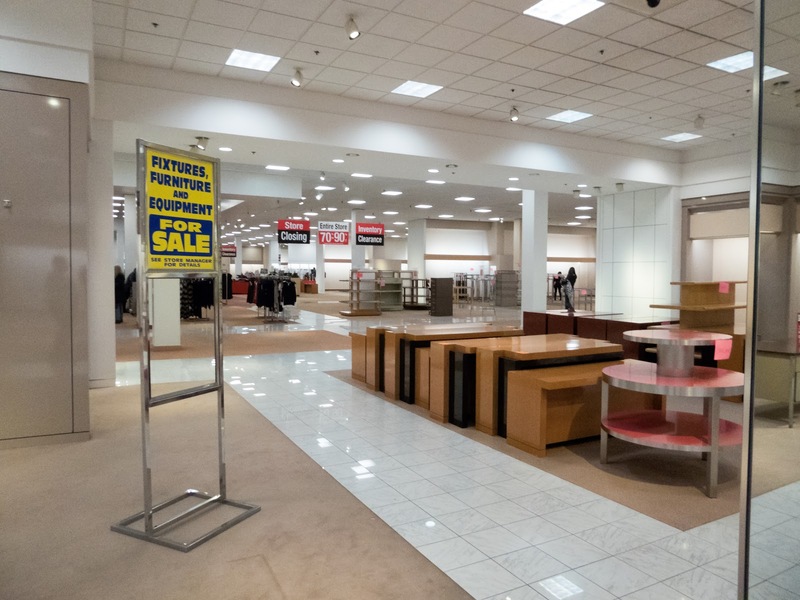 The future of the mall does remain in question. 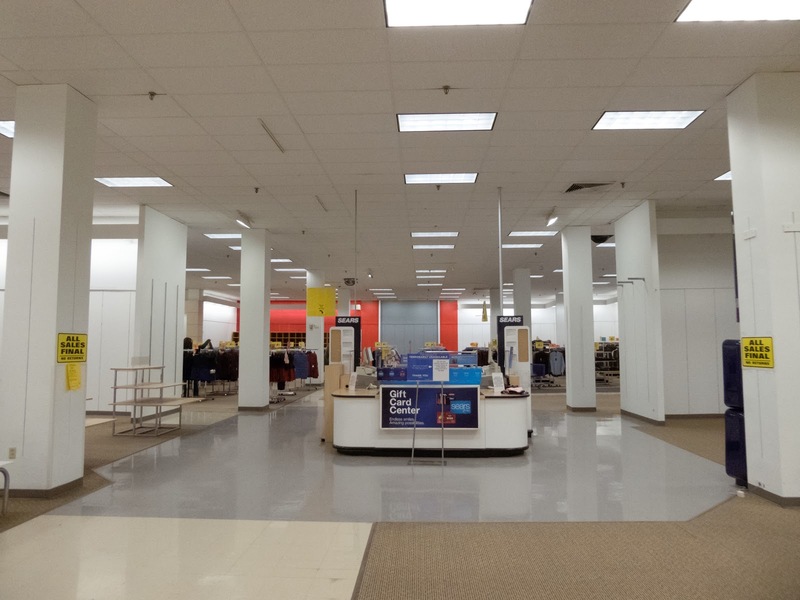 The Sears wing was mostly empty on my visit. FYE was shutting its store down. 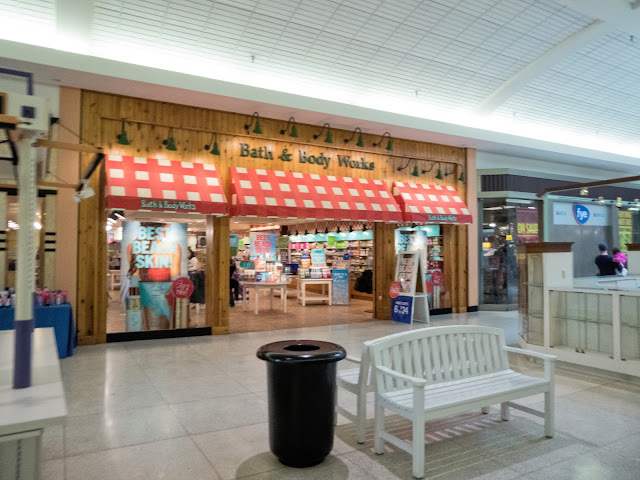 Other retailers, like Bath & Body Works, haven't updated their stores. Rue 21 was announced to be closing after my visit. 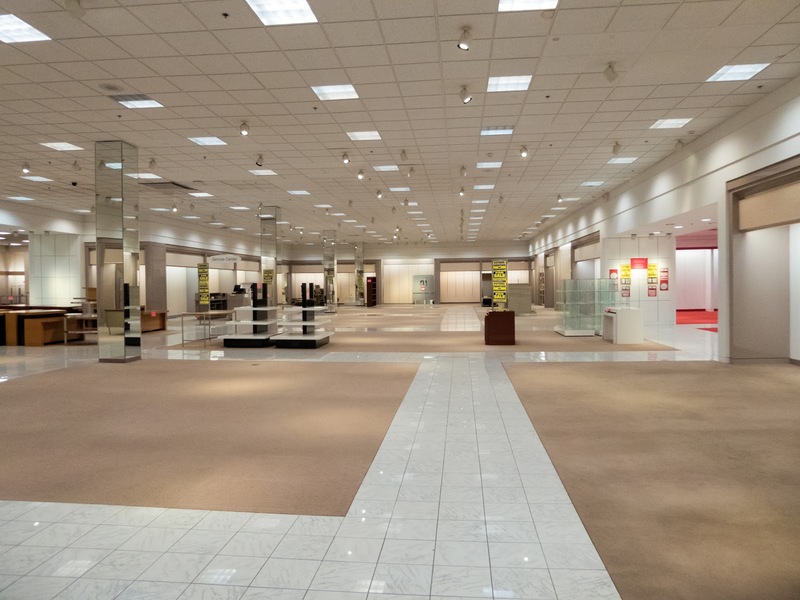 The mall seems to have one particularly valuable asset: its location. Three major roads intersect at the mall. East State Street runs to the south side of the mall, North Hermitage Road runs to east side of the mall, and Shenango Valley Freeway (a relief route to East State Street) ends into the mall. I don't know how much more retail can be built up in the area though. There are a number of major shopping centers and big box stores around the mall. 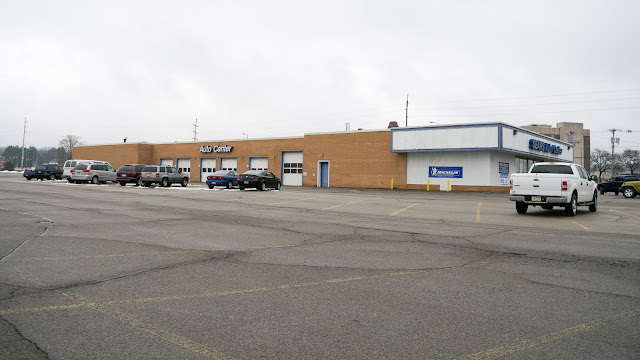 However, while Hermitage and Sharon are mid-sized towns, more people might shop here from the east side of Youngstown, which is more of a retail desert. 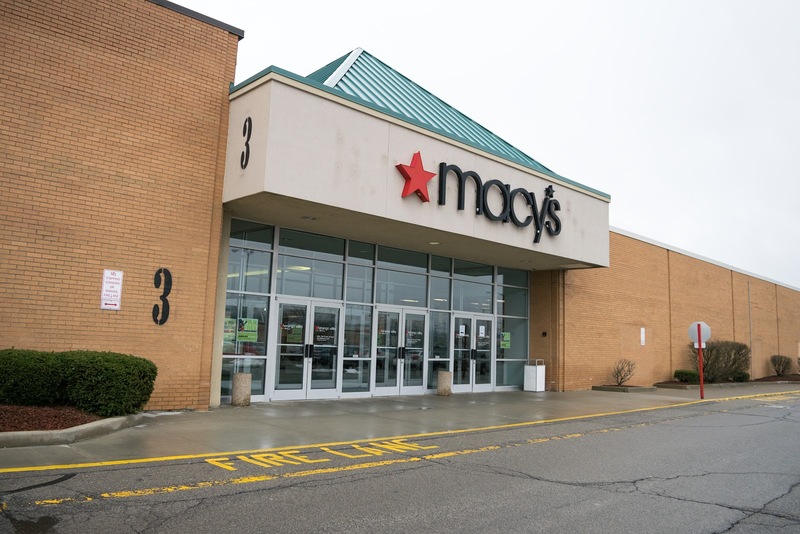 That would place this mall in direct competition with the two major Youngstown area malls, Eastwood Mall and Southern Park Mall. One advantage the Shenango Valley Mall does have over the larger malls across the border in Ohio is that clothing and footwear sales are tax free in Pennsylvania. Hermitage also has a median household income of $56,986 according to city-data. The city of Hermitage has only 16,118 people, but Mercer county does have 115,195 people. I don't think an outlet mall would work for Hermitage since there is a Premium Outlets already in the county. 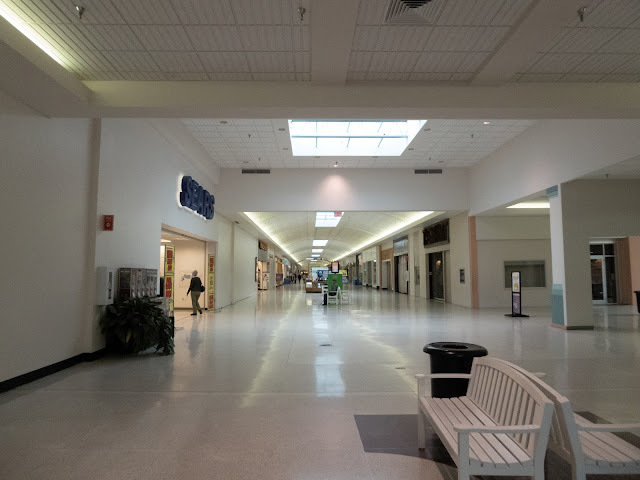 Needless to say, something major needs to happen with the Shenango Valley Mall if it is going to continue to exist in the long-term. 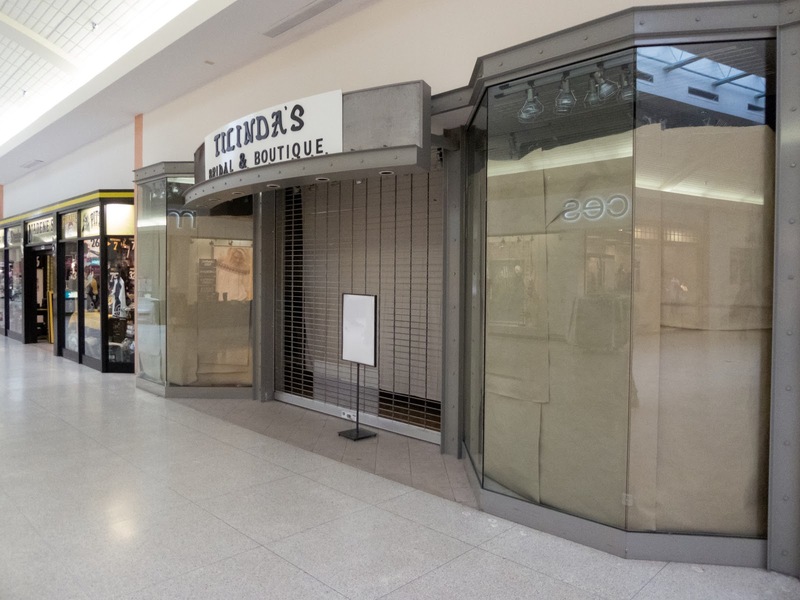 Now that two of its three anchor stores are gone and there are a number of vacancies inside the mall, time seems ripe for a redevelopment. If nothing is done, I wouldn't be surprised if the mall ends up boarded up within a couple years. Anyway, below are the pictures I took of the mall, the closing Sears, and the closing Macy's in March 2017. Antiques store and playground area. I don't know what the store was before, but the design looks really familiar... It looks like a bookstore to me, but there was a smaller Waldenbooks / Borders Express elsewhere in the mall. 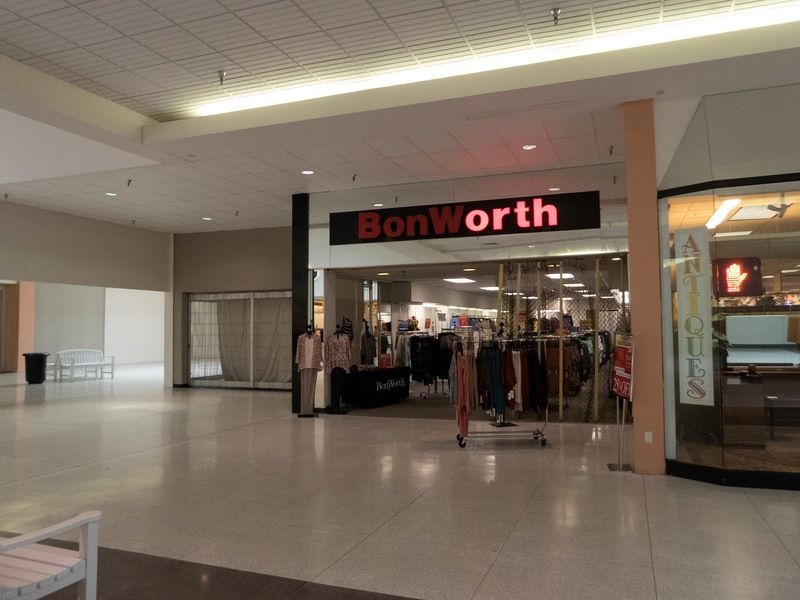 BonWorth; the only chain store left in the Sears wing. The main mall corridor... 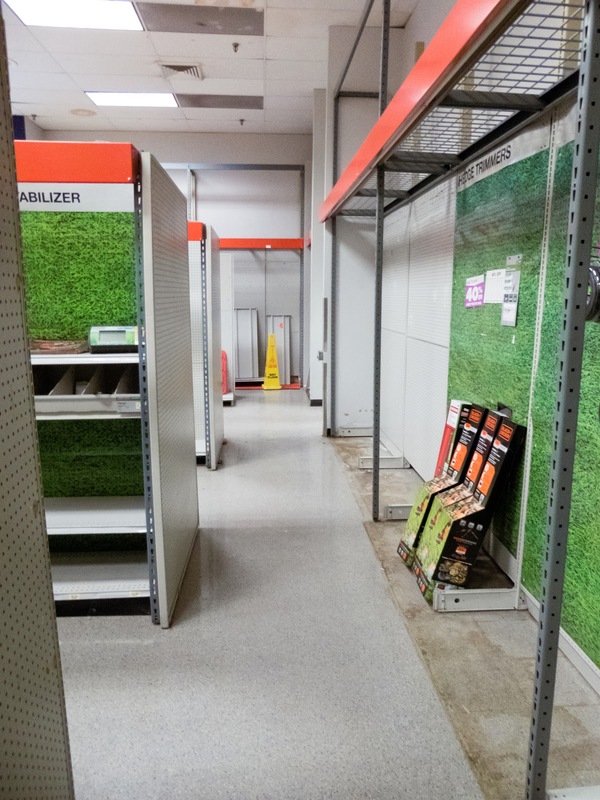 The Payless Shoesource store in the background made it through the most recent closings wave. 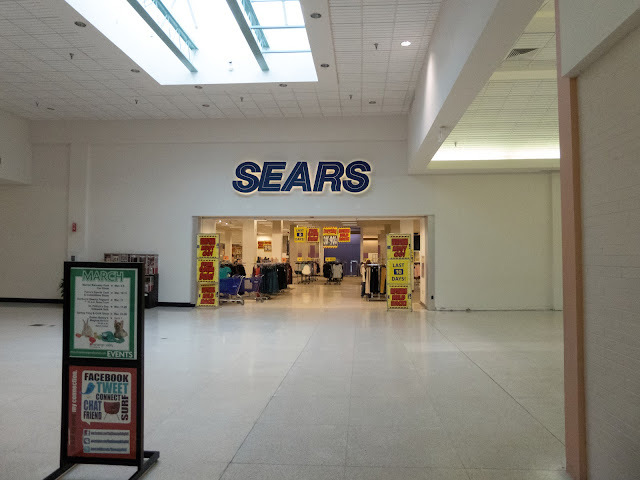 The entrance to the north wing was between Sears and Payless (where the wall sticks out a little). Former Foot Locker store. This appears to be a recent casualty since it is still listed on the directory. 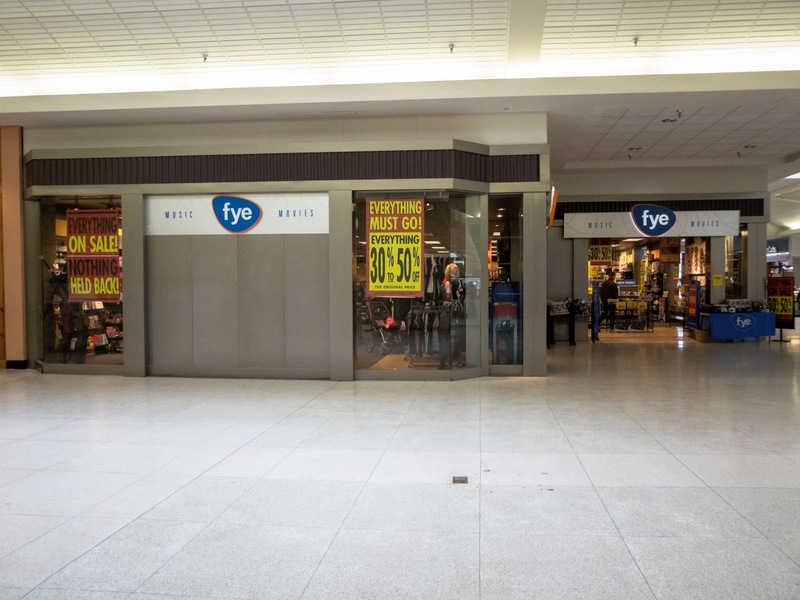 The closing FYE store. This was previously a National Record Mart store until 2002. There was a Rue 21 store right outside of this shot to the left that was announced to be closing as well after my visit. 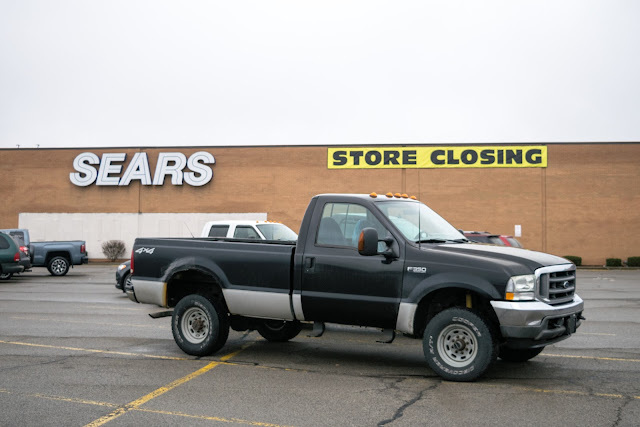 Yes, the Sears Auto Center is staying open! 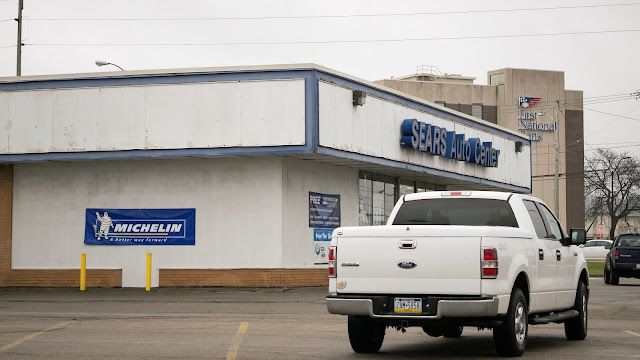 The Sears Auto Center in nearby New Castle, PA also stayed open despite the department store closing. I found a photo of this Auto Center from 1979 with the gas pumps still outside! Below is a link to a vintage photo that gives a peak at what the store looked like as Strouss, before the typical Kaufmann's style entrance was added. The W.T. Grant facade was removed before the store became Strouss. Also visible is the Penneys Auto Center and gas station (now Firestone). To the left is the former W.T. Grant space. 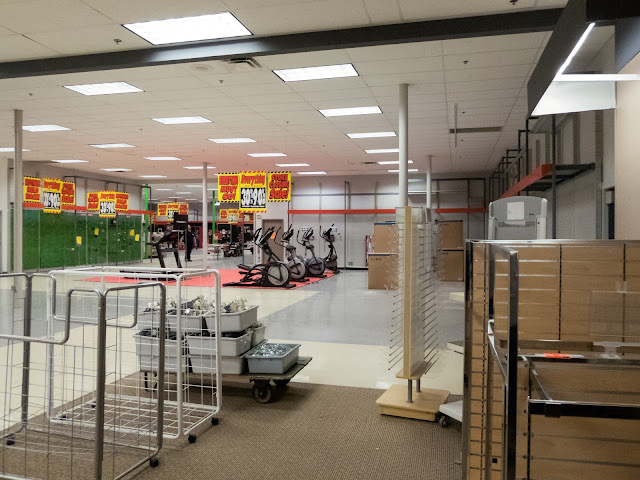 The store expanded from 76,000 square feet to 106,000 square feet by taking over another space (I think a grocery store) to the right. That is why the right side of the store sits further back. The later addition to the store. 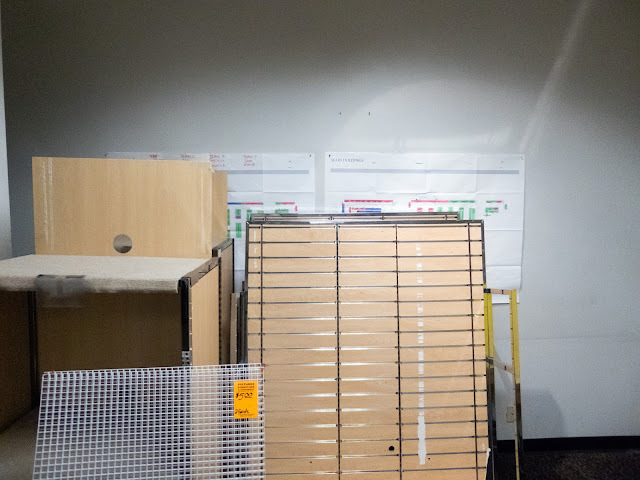 Closed store entrance, this back area of the store was walled off on the inside. It looks like this was a garden center at one point. 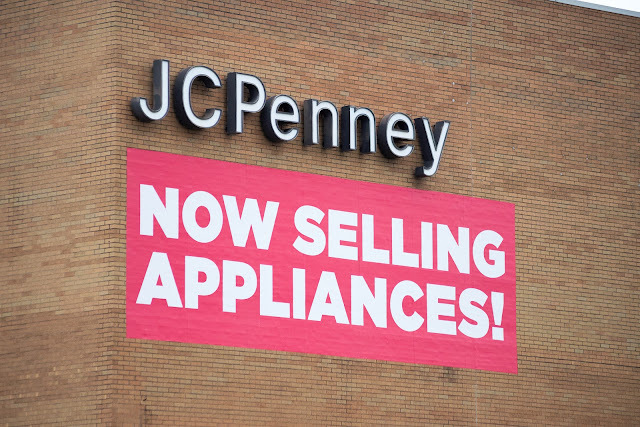 It seems like a good sign that this store is selling appliances. This was just a very quick idea I came up with for a potential reconstruction of Shenango Valley Mall. I don't know if there are any actual plans to redevelop the mall or what those plans might entail. 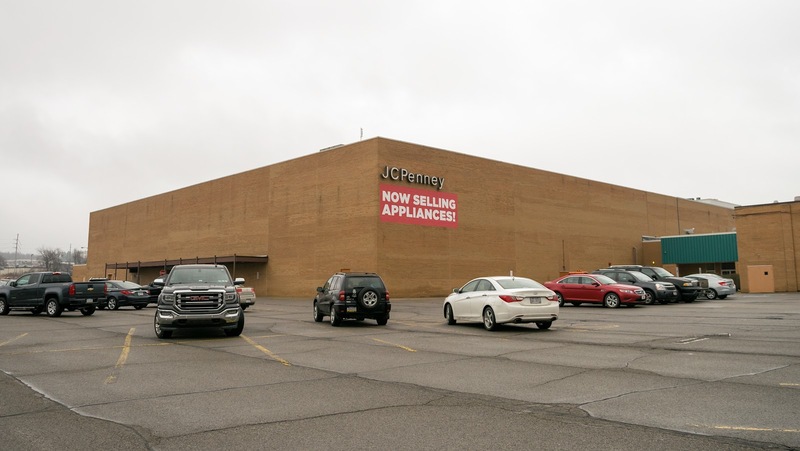 The largest obstacle to designing a new strip mall type shopping center has to be the JCPenney store in the middle of the site. I doubt JCPenney would invest in moving off to the side of the site more, so any redevelopment plan would have to include JCPenney in its current location or risk losing the store. Also, JCPenney would have to be facing the street instead of hidden behind the back of the mall. The easiest way to do this seems to be chopping the mall in half lengthwise and completely demolishing the south half so the current JCPenney mall entrance becomes an exterior entrance. The entrance around back would be bricked in and the back of the shopping center would only be used for receiving. With the front of the shopping center pushed back, there is also more space for out-parcel stores and restaurants. Most of the shopping center, under my idea would face East State Street (bottom of picture), but would also turn and face North Hermitage Road (left side of picture) for a little. This would allow all stores to face the major road that is closest. There is also a large lot (currently used for farming) to the north of the mall. 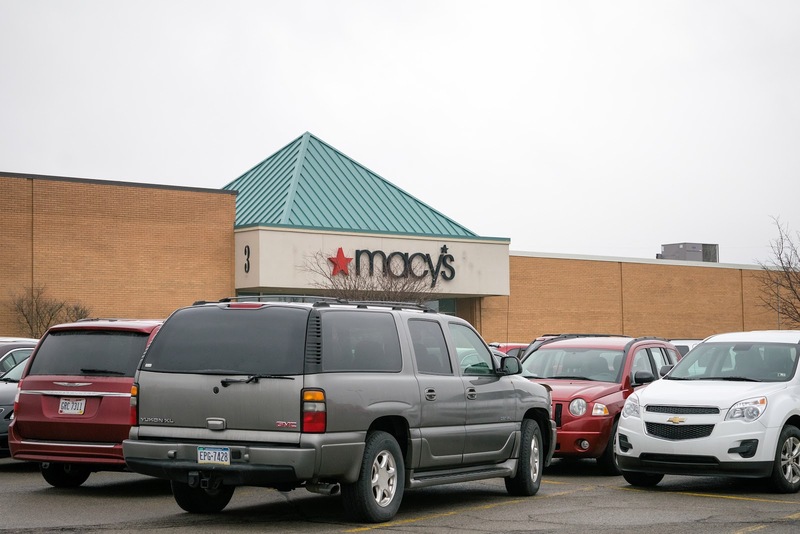 If any big box store (such as Meijer or Menards) or a residential development builds there later on, it would make sense to connect the shopping center to it. 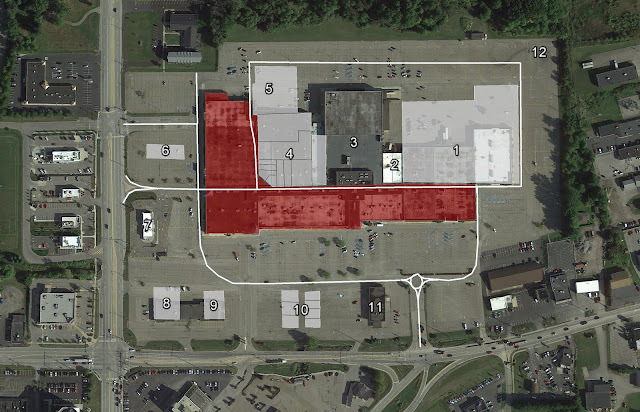 Phase 1 would reconfigure the Sears side of the mall (left) since that side faces the largest road and this phase would include space for mall tenants to move out of the mall (before Phase 2 starts) without disrupting operations. Also, the Sears side is the emptiest area of the mall. 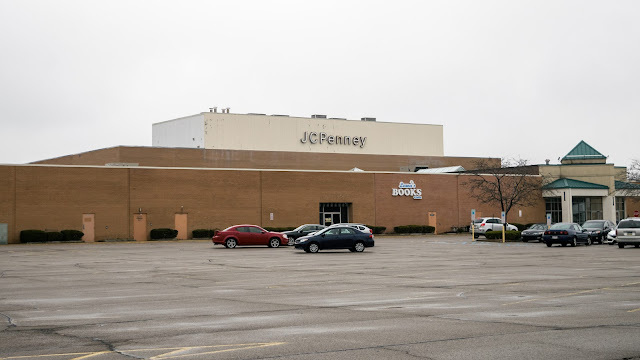 Phase 2 would tear down the rest of the front of the mall, give JCPenney a front facing exterior entrance, and add a new big box store anchor where the Macy's store used to be. 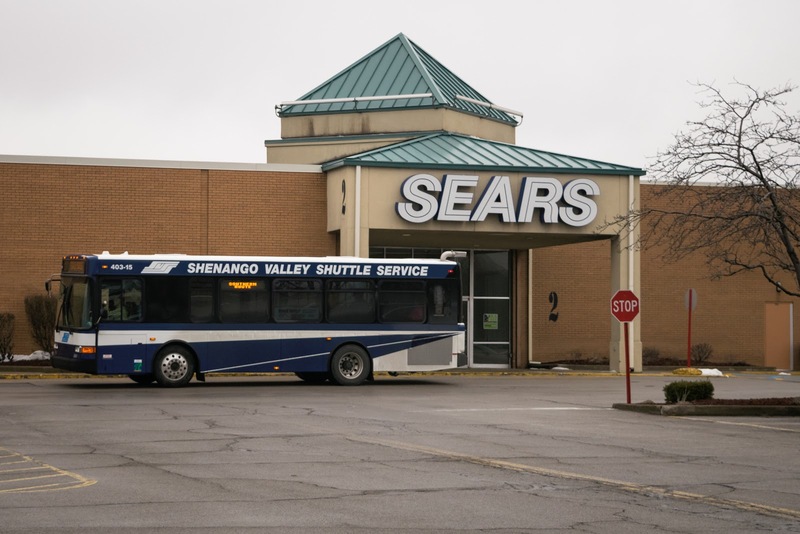 The name of the shopping center could also be changed to something similar, such as Shenango Valley Center. 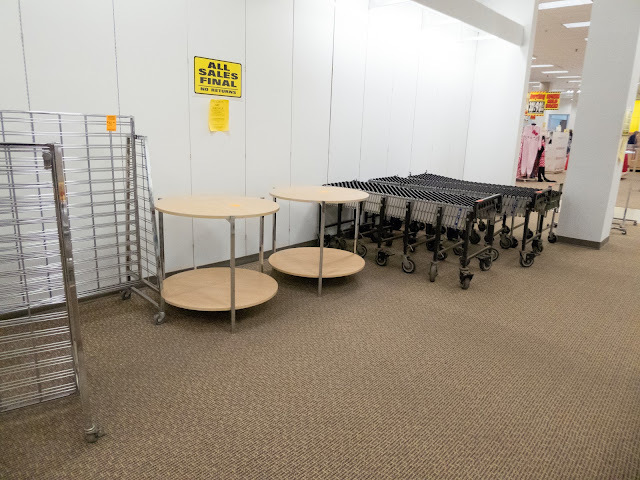 This space would mostly sit on the former Macy's site and be a little pushed back to accommodate a larger big box store such as a Target. 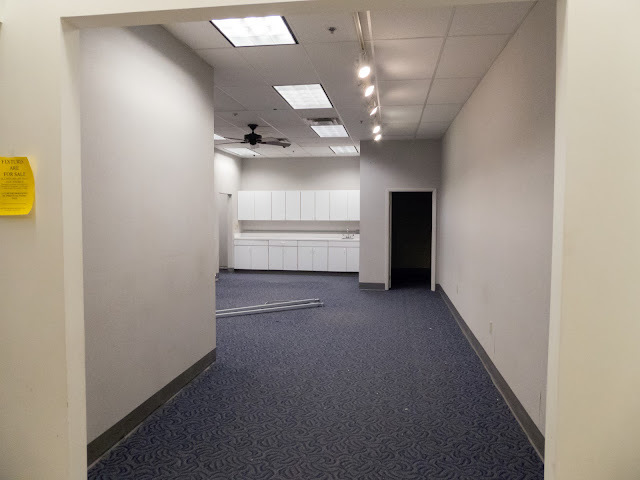 This space would be the home for small stores, such as Maurices, under my idea. This space would remain JCPenney, but with a front facing exterior entrance. If JCPenney leaves in the future, the store could be changed to another store such as Boscov's. The curve in the shopping center would house various small / medium sized stores and restaurants. 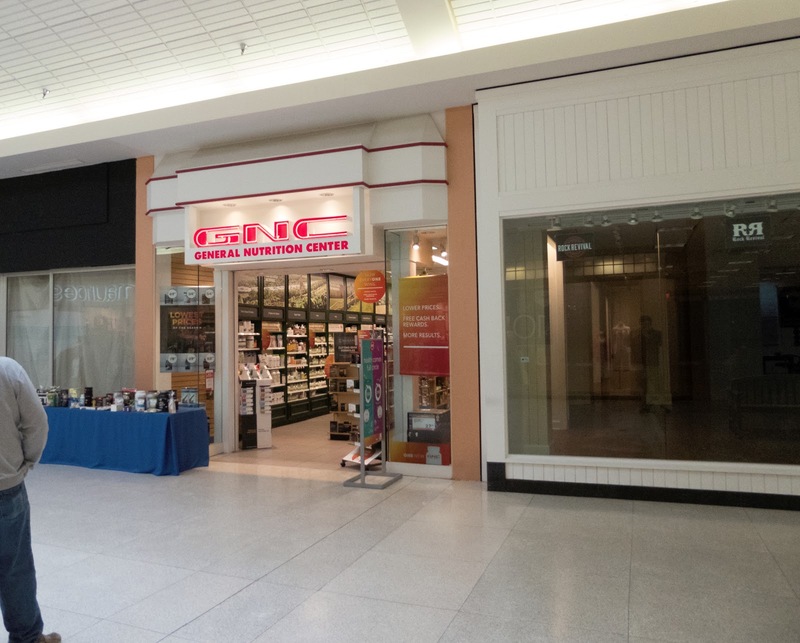 This would include current mall stores, like GNC, that might be interested in staying through a transformation. This could either be a new build or reuse of the old Sears space. A medium sized anchor store such as HomeGoods, a furniture store, a gym, or a grocery store. A fast food restaurant such as Chick-fil-A. This space would remain Wendy's. A larger restaurant, such as Cracker Barrel. A medium sized restaurant, such as Longhorn Steakhouse or Olive Garden. Various small out-parcel stores and restaurants. Excess space behind the shopping center (former parking lot) could be used for a storage business or some small industrial facilities. It seems like there isn't that much information on the Shenango Valley Mall online. 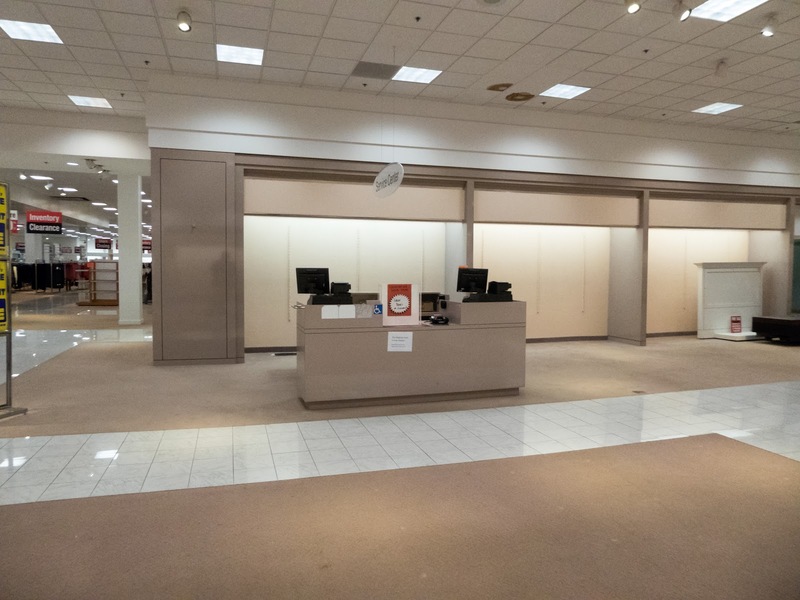 The mall doesn't have a Wikipedia page and there aren't many photos of it online. When I was researching the mall, I couldn't even find an exact opening date or even year. I can usually find them by looking through archived newspaper articles, but I couldn't find any mentioning the mall's opening. About half of the sources I found mentioned the mall opening in 1967 and the other half mentioned the mall opening in 1969. I couldn't find any mentions of the mall in store ads prior to 1969, though it is possible the mall did open in 1967. 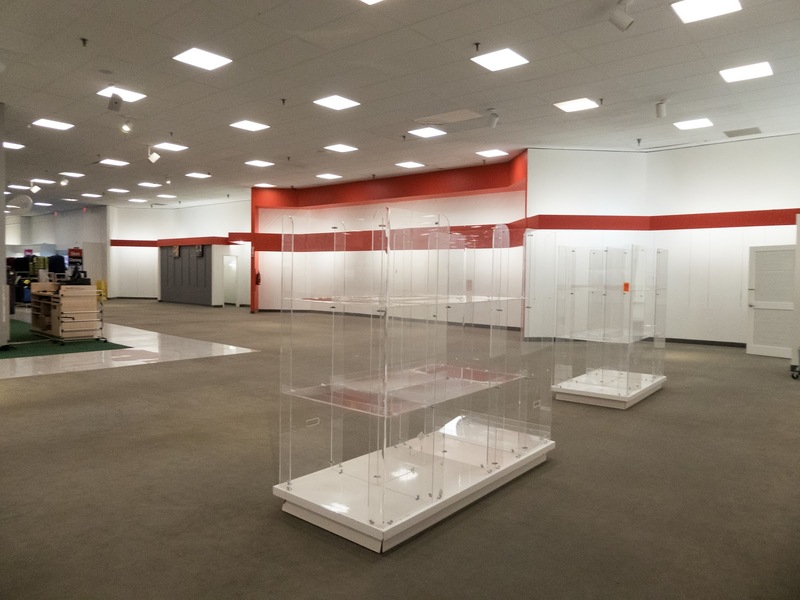 The JCPenney store is listed as opening on January 23, 1969, so it seems more likely to me that the mall was opened in 1969 rather than 1967. I am sure 1967 would still have some significance to the mall though. It might have been when Crown American started developing the mall. 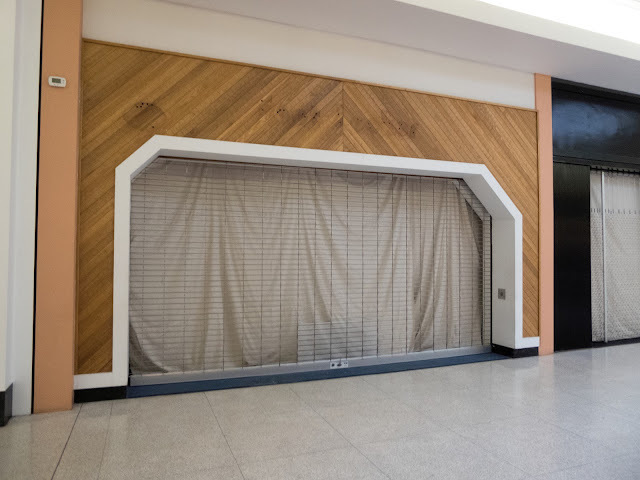 If anybody knows for sure when the mall opened, please let me know below in the comments. Another thing I had trouble with is identifying some previous tenants. 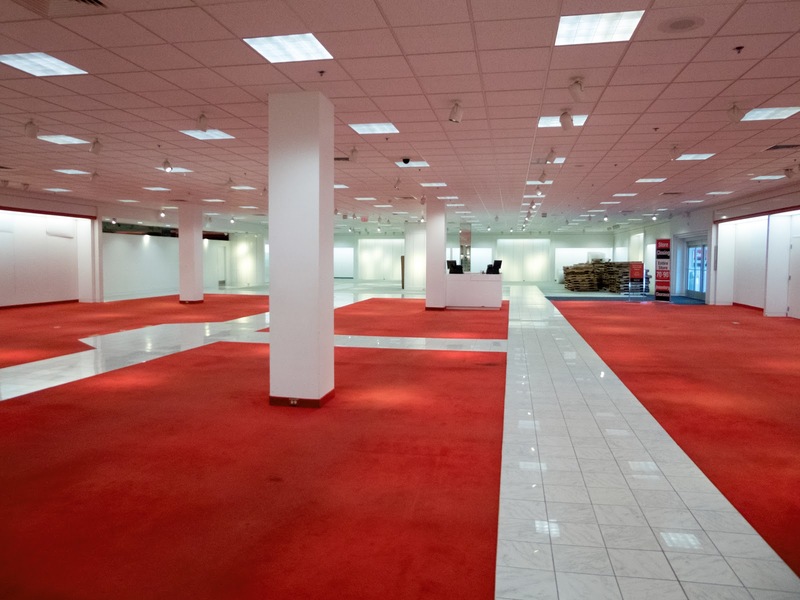 Most of the former Strouss, Kaufmann's, and Macy's store was W.T. 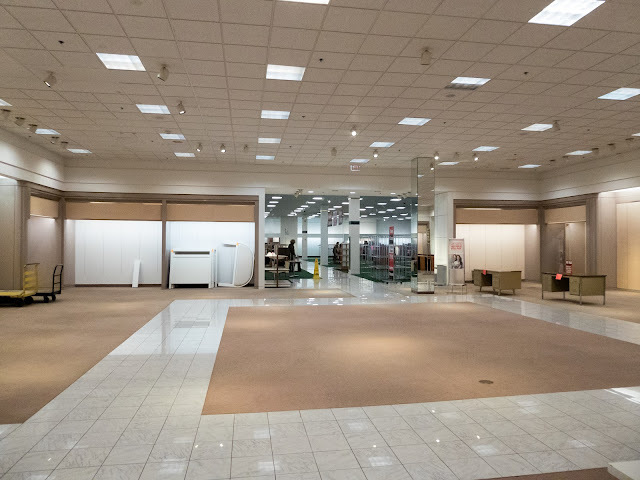 Grant (76,000 square feet of the 106,000 square foot store), but historical imagery shows that the other space came from a store that was attached to the side; it didn't appear to have mall access. I would guess that it was a grocery store such as Kroger or A&P; I couldn't find any mention of what it was though. It would have been open alongside Strouss before the store later expanded and took the space over. I also couldn't figure out what the current Antiques store was before. I have saw the design before, but I can't quite put my finger on what it was. Needless to say, losing two anchors at one time is going to be very hard on this mall. 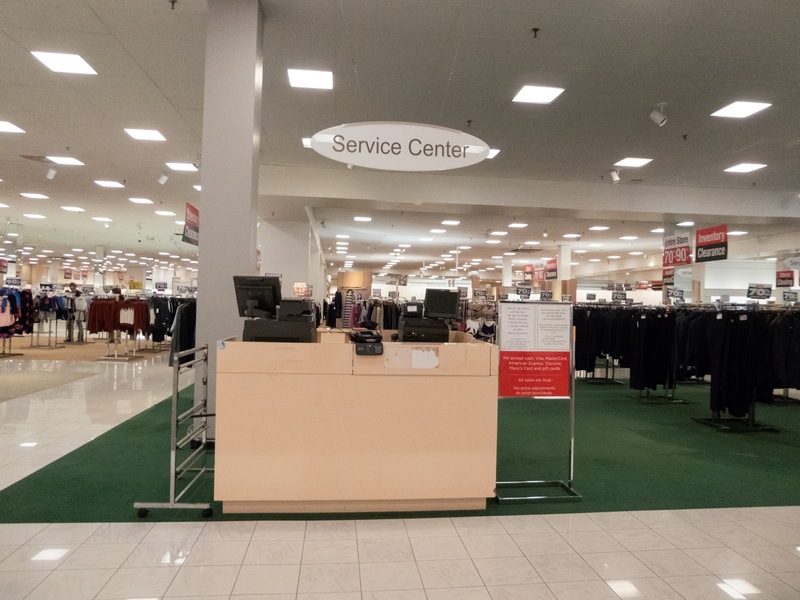 The mall management probably saw it coming, but they were probably hoping for a miracle. I can't really suggest any redevelopment plans since I'm totally clueless about the area, but maybe a Burlington Coat Factory type store can help replace at least some of the demised anchor space. The JCPenney signage is very vintage, I like it. The mall entrance to the Sears is one of the most plain mall entrances I've ever seen even compared to other Sears. 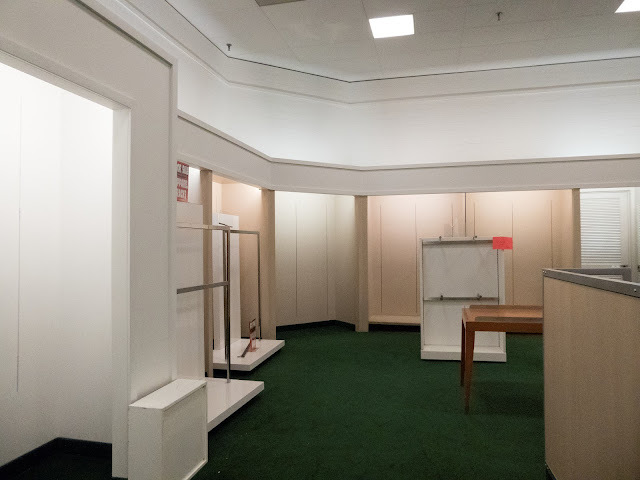 The Macy's store looked pretty vintage. 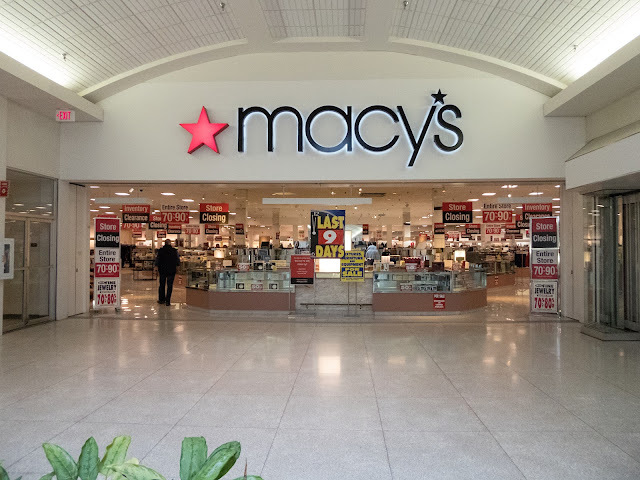 Perhaps not as vintage as a couple of Macy's that closed recently in Houston (Greenspoint Mall and Plaza Paseo/Pasadena Town Square), but still vintage nevertheless. The Foot Locker is a real retro gem even if the store is now closed. It's a shame that the fye is closing, mall music stores have become very rare around these parts. Anyway, thanks for the photos. 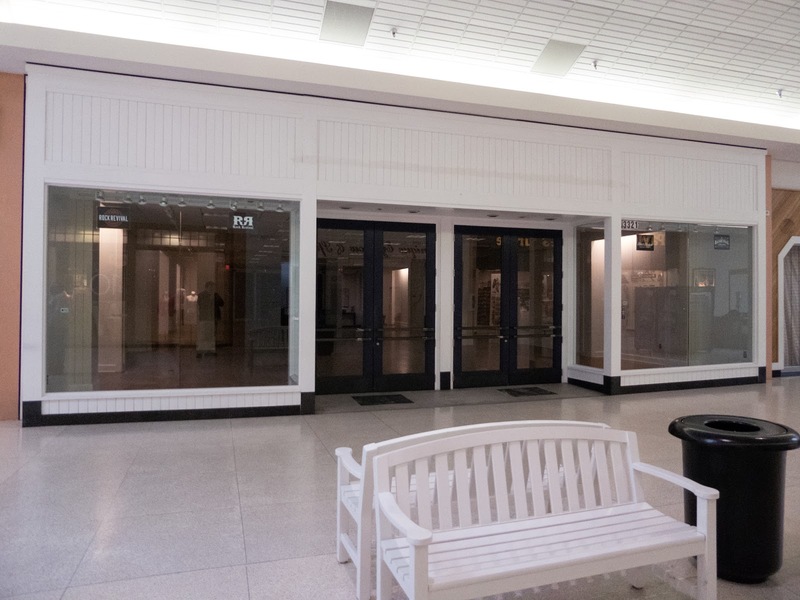 It's good to read about a little known dying mall. Hopefully the mall management team will be able to come up with something successful. Yeah, I imagine that mall management heard about the closings before the general public. Usually store and mall management are made aware of closings ahead of time. 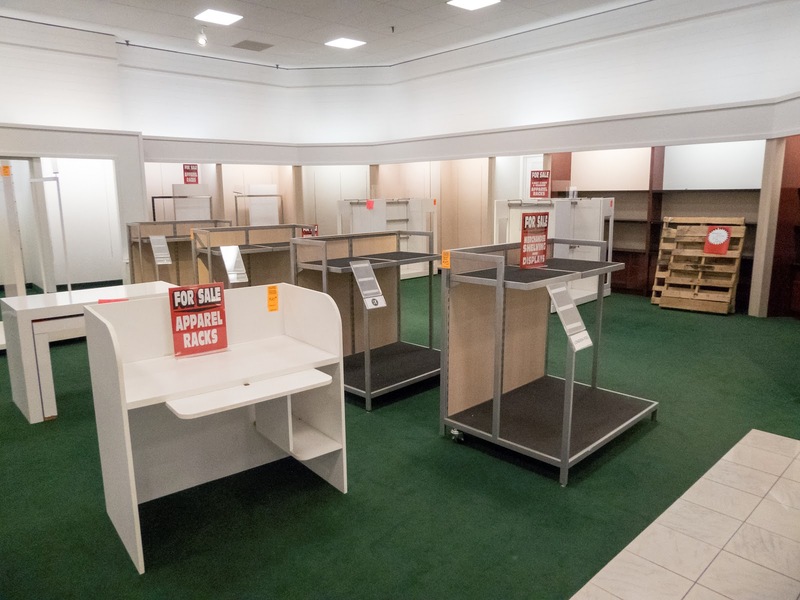 Mall management also knows when leases expire, so they can know what to expect in the future(except for chains that declare bankruptcy),such as which stores are likely to renew or leave. 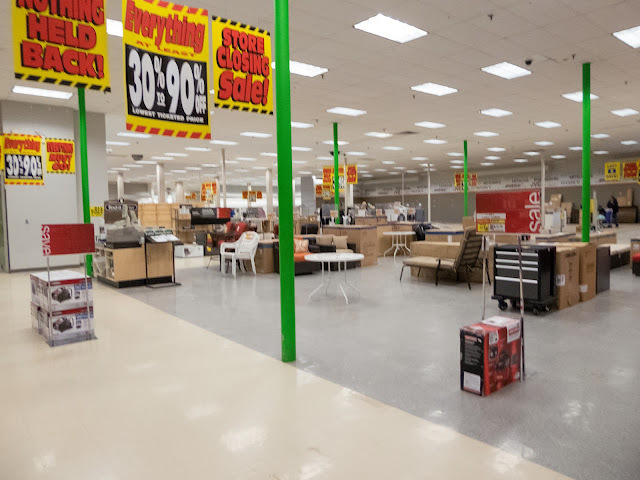 I could see someplace such as Rural King want to move into the Sears or Macy's stores. Those stores don't draw much mall traffic and some of them attached to malls seal off the mall entrance. The JCPenney store seemed to be fairly busy at Shenango Valley Mall, at least it seemed busier than the store in my town. I think running a mid-price or more value based shopping center would be the best bet. It would have to have pull in stores not currently in the town (such as Five Below, Burlington, Target, or Gabe's). The town has Walmart, Home Depot, Lowe's, Kohl's, and Kmart. The Macy's store was in fairly decent shape compared with others in the area. They definitely haven't changed anything since Kaufmann's. 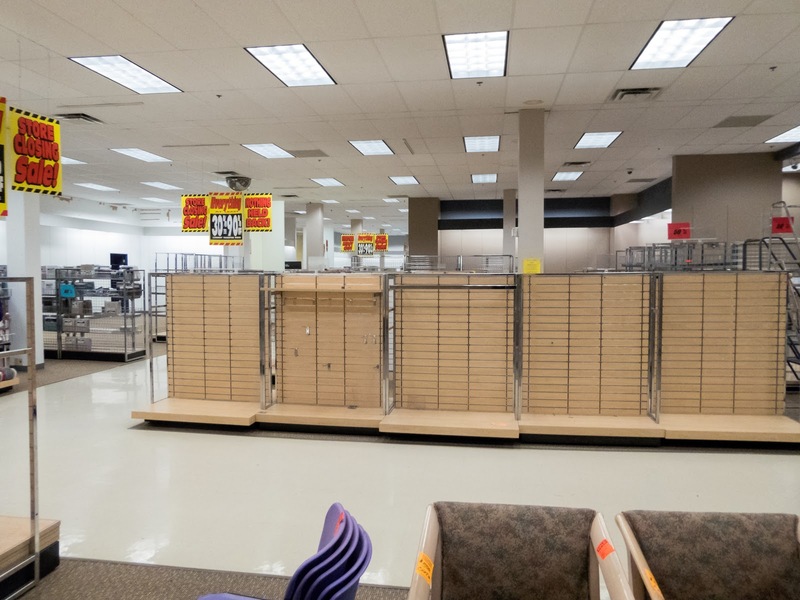 Then again, I can't think of a store they did update since taking over May department stores in 2005/2006. 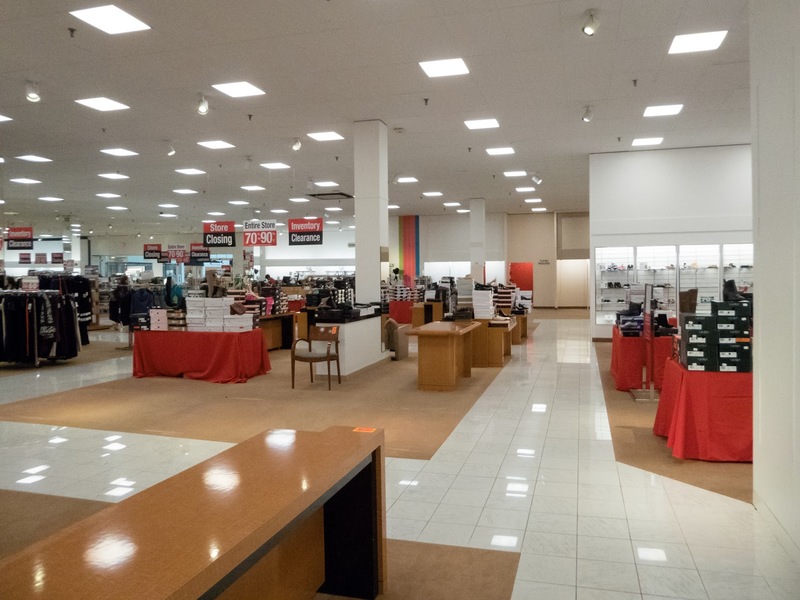 Macy's seem to neglect their stores quite a bit, at least in Ohio and Pennsylvania. I hope they do figure out something to make the mall successful. I wrote a deadmalls entry a couple of months ago and found some additional information on Shenango Valley you don't have — I didn't know of the W.T. Grant, but you're missing info on the grocery anchor and also on some of the renovation history of the mall. Let me know and I'll send it to you. Perhaps you could add your piece and we could send in the entry to them together. Do you know what the grocery anchor was? My best guess was Kroger since they had a bunch of stores in malls early on. 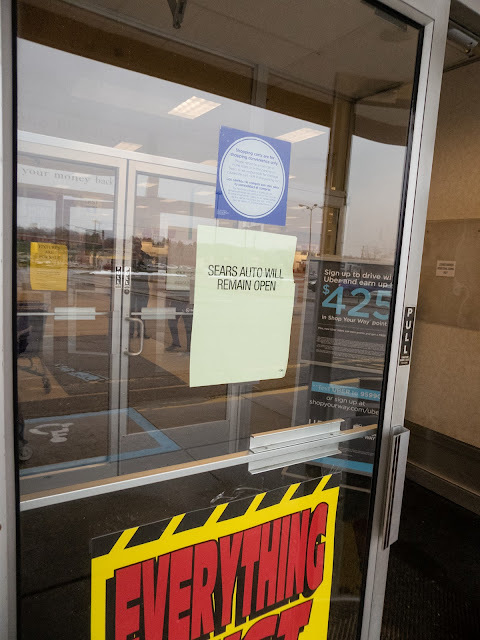 I searched for old grocery store ads yet I couldn't find any ads mentioning a Shenango Valley Mall location. By grocery anchor, you talking about the space next to the W.T. Grant / Strouss building, right? I saw another remodel mentioned around 1976 (the year Strouss was moving in). I know that there was an expansion to the Sears wing between 1970 and the early 1990s(based on historical aerial imagery). 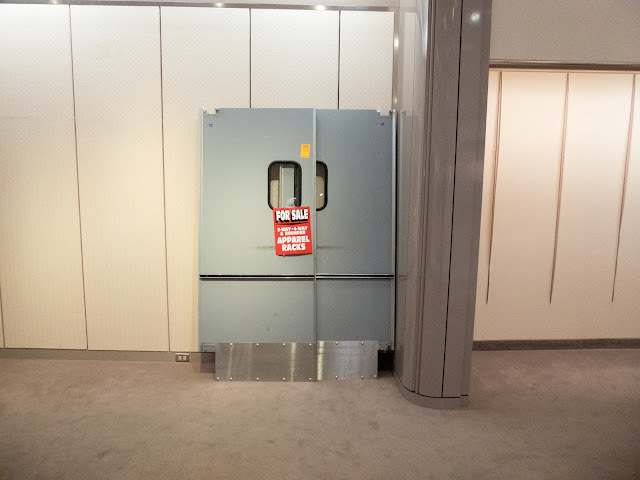 I wonder if that was part of the 1976 remodel. The expansion included the store that I couldn't figure out what it was prior (now an antiques place). 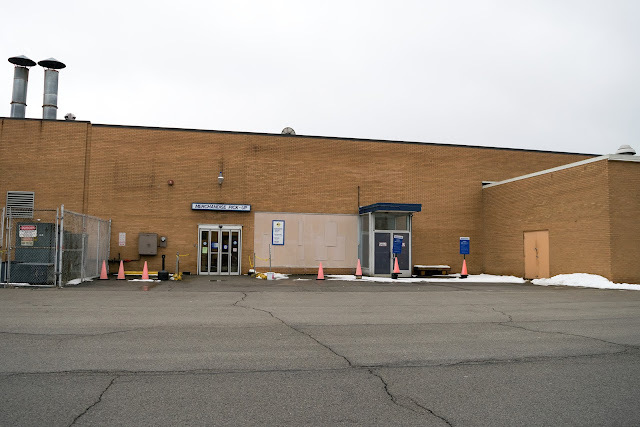 I noticed during research that the North Wing was opened back up, but the new entrance was hidden down the hallway with the restrooms and offices. I didn't know of it when I went there and took the photos. Someone did a YouTube video on it though. On October 14, 1967, Crown American, one of the leading mall developers in the state of Pennsylvania, introduced shoppers in Sharon and Hermitage (in the far western portion of the state, just across the Ohio border) to its newest center: the Shenango Valley Mall. 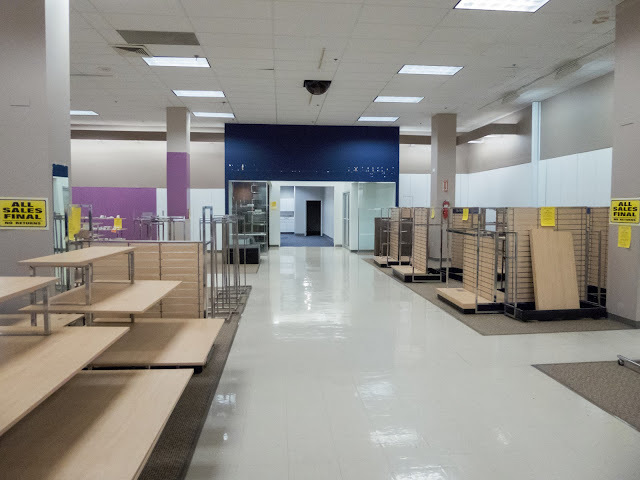 The mall boasted Sears, Penney’s and W.T. Grant as anchors, and a BiLo supermarket also was attached to the regional center. 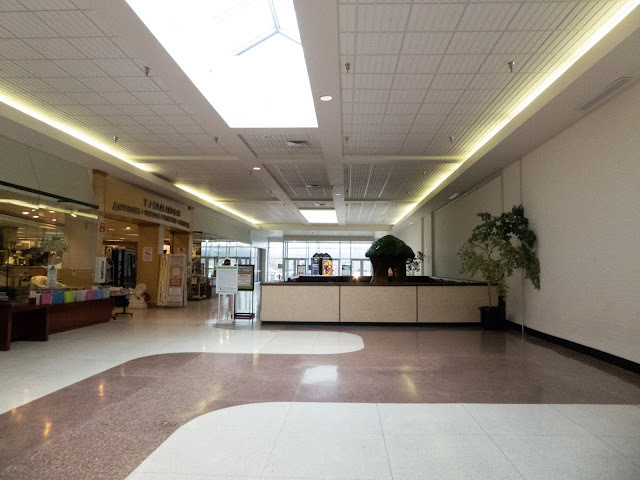 The 1970s were perhaps the best time for this mall, and they certainly were the highlight in the expansion department. 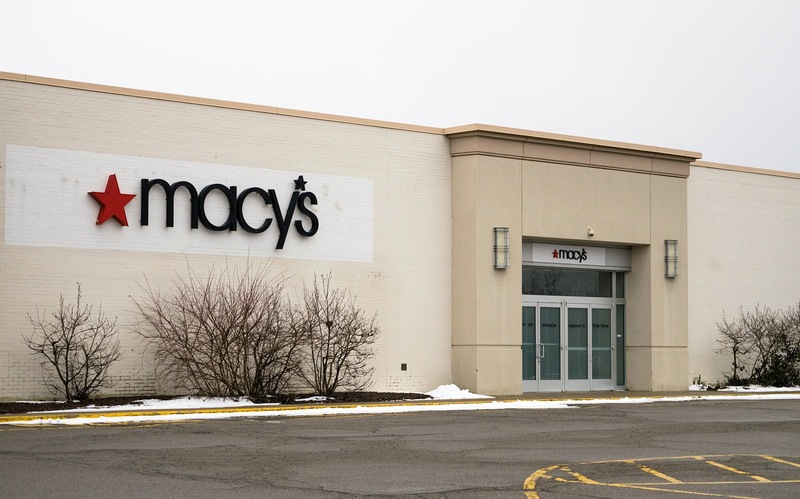 The two major events were the addition of new inline stores in the mid-1970s, as well as the 1979 opening of a 76,000-square-foot Strouss department store on the east side (replacing Grant’s). 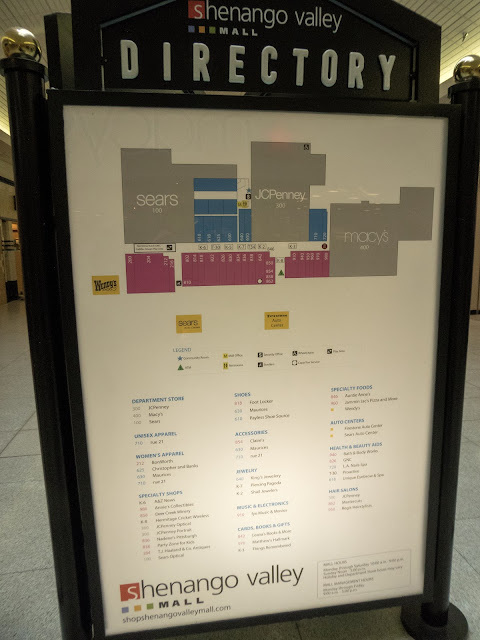 The mall now boasted a T shape, with Sears and Strouss on the main corridor and JCPenney in the back. It also had further hurt downtown Sharon by undercutting the business of the existing branch of Strouss, which would close not long after. The first anchor changes at the center had to do with Strouss, which was based in Youngstown. The May Company acquired the chain and converted the locations to Kaufmann’s in 1986. The 90s brought new competition and a need to renovate. 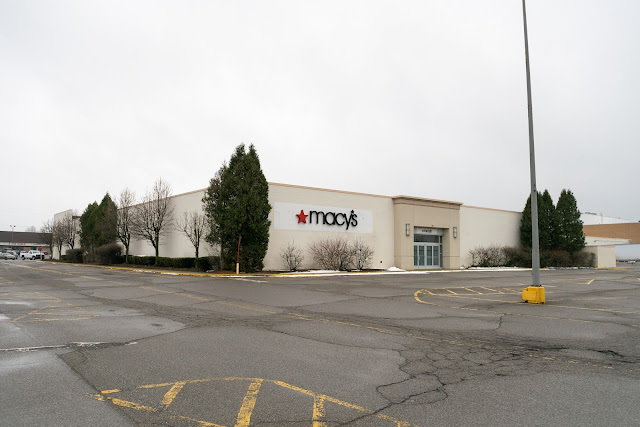 The Prime Outlets at Grove City opened in 1994 and threatened to take away many inline tenants from Shenango Valley. In response, Hermitage officials successfully lobbied Crown American to carry out a $3.5 million renovation in 1996. The renovation spruced up the mall corridor and the Sears store and brought the gross leasable area of the center to 512,000 square feet. 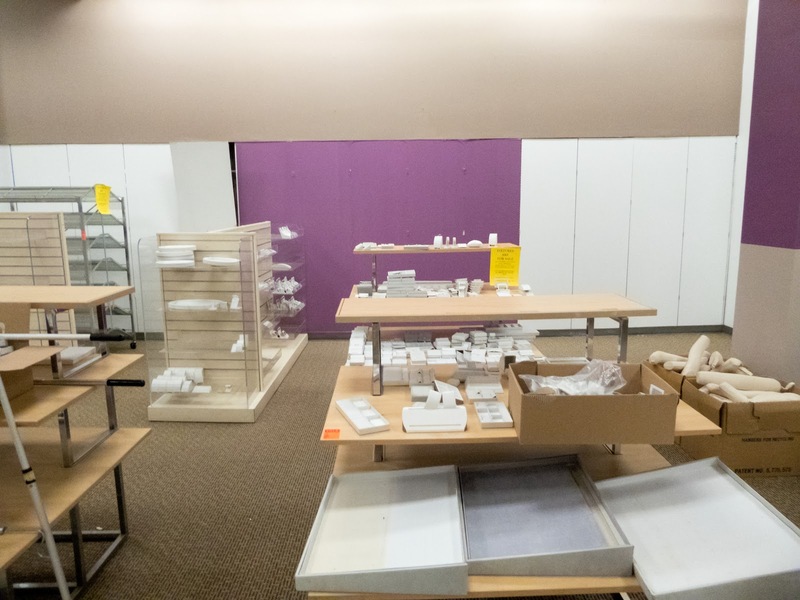 It also helped the mall retain smaller stores. 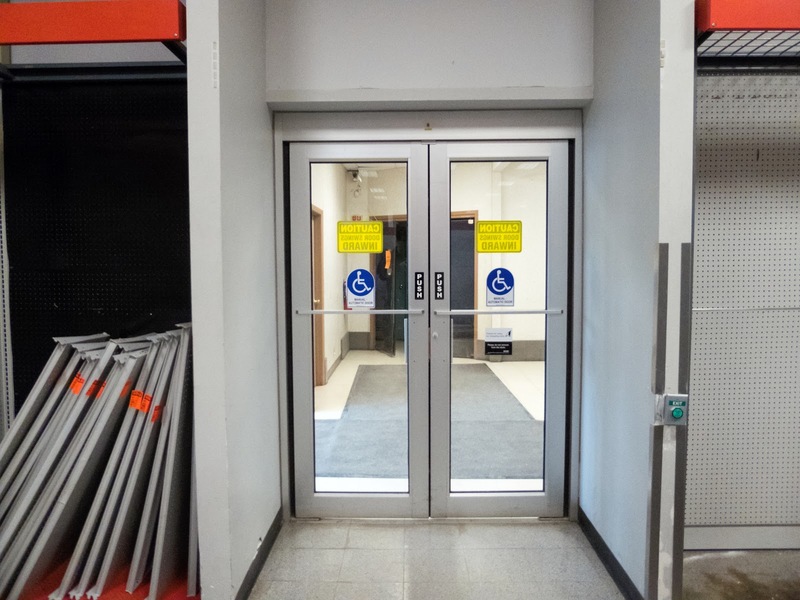 Two years later, May Company expanded the Kaufmann’s store by absorbing the 30,000 square feet left over from the closed BiLo; it also renovated at this time, particularly its entrances. The mall was sold by Crown American to PREIT in 2003, who turned around and sold it to Lightstone in 2005. In 2006, Kaufmann’s converted to Macy’s, marking the third nameplate on the east wing department store since its construction. You might be wondering at this point… “Wait! 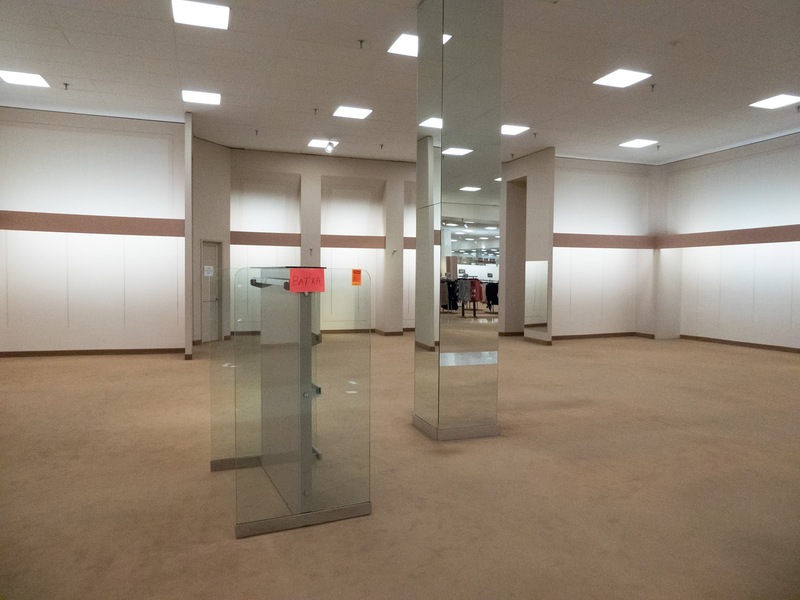 This is deadmalls.com. 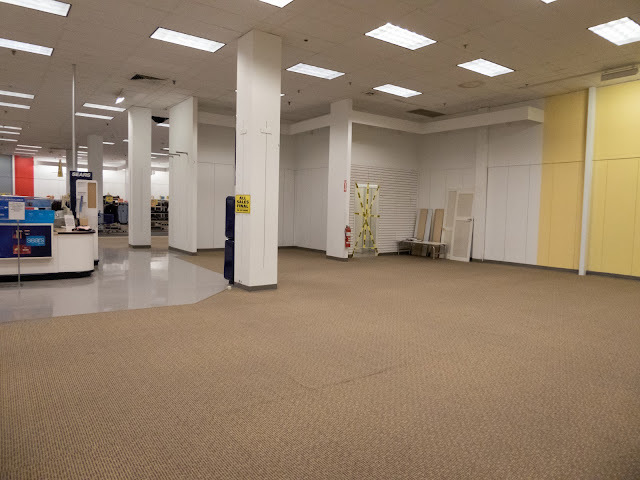 This mall doesn’t sound dead!” You would have been right on Christmas Day 2016. Then the gong sounded. 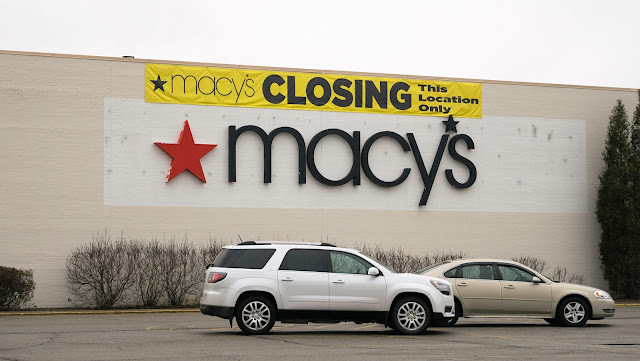 On January 4, the same day Sears released its full national list, Macy’s added insult to injury when it announced 68 of the 100 stores it planned to close in 2017. Shenango Valley made that list as well, one of six locations in the Keystone State to be shuttered and the only mall to lose both Macy’s and Sears at the same time. 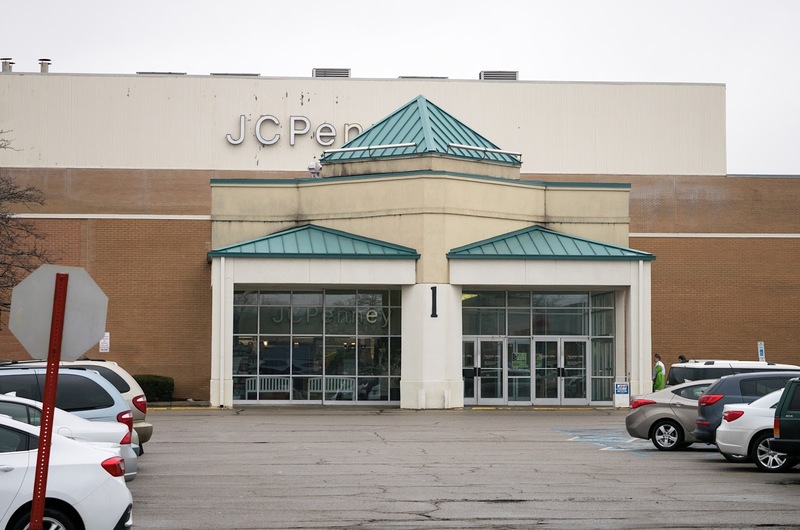 Only JCPenney remains at the center, and if shoppers seek to drive across the state line to shop the Macy’s and Sears stores in Warren (Eastwood Mall) and Youngstown (Southern Park Mall), they will find JCPenney locations at both of those malls as well. 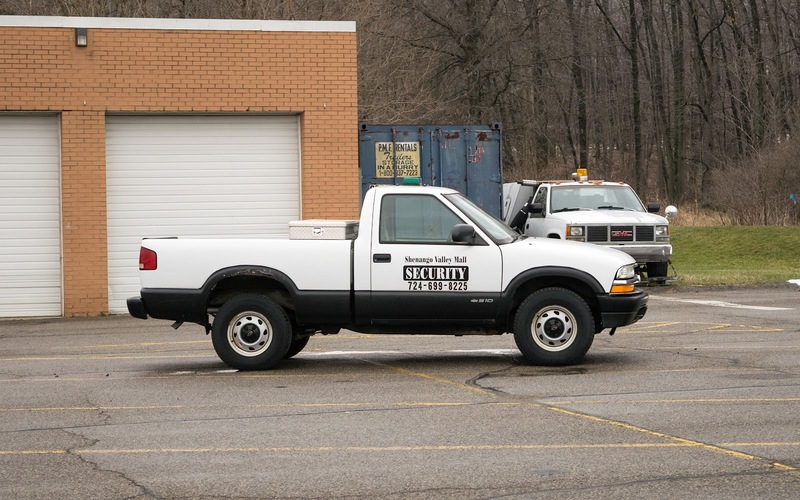 With a questionable regional economy and two crippling blows inflicted in one week, Shenango Valley is definitely on the endangered species list as it approaches its 50th anniversary. 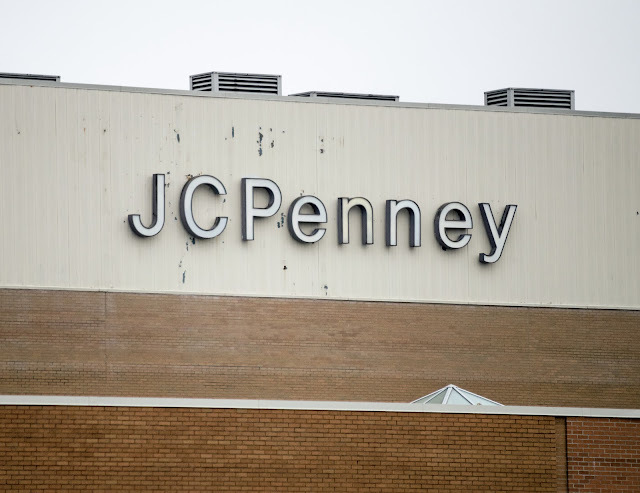 Its fate is in the hands of JCPenney. 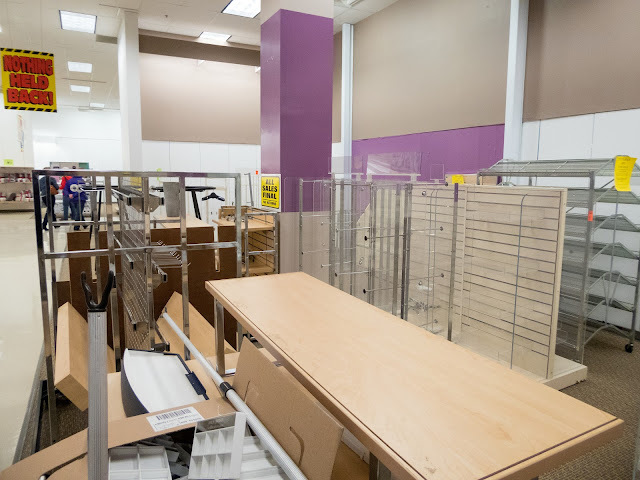 As long as CEO Marvin Ellison decides not to conduct further store closings, this mall could hang on. But owner Sterling Properties Management will have trouble attracting replacement tenants for Shenango Valley’s anchor stores, given the location and regional environment. With lost anchors, the center’s inline tenants could very well flee, and its continued future could get very cloudy indeed. 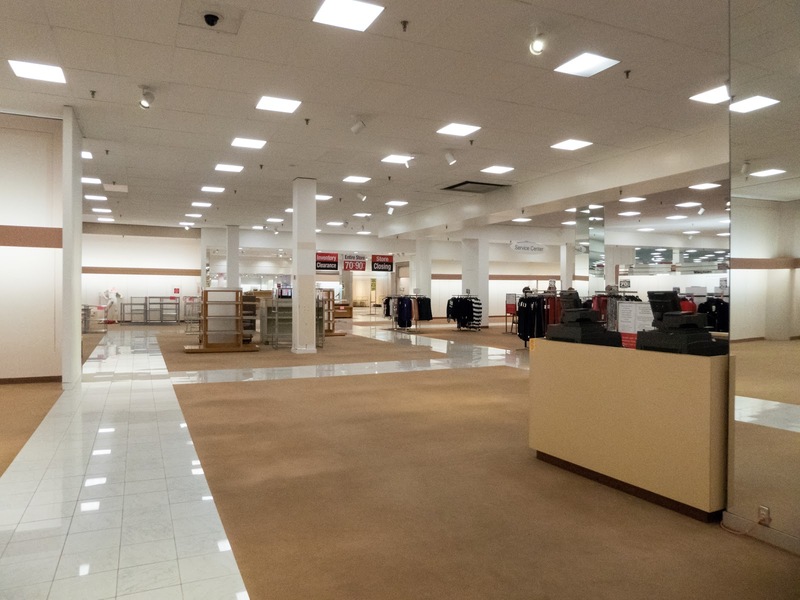 It's amazing how May and Macy's never touched the nasty looking vintage carpet. 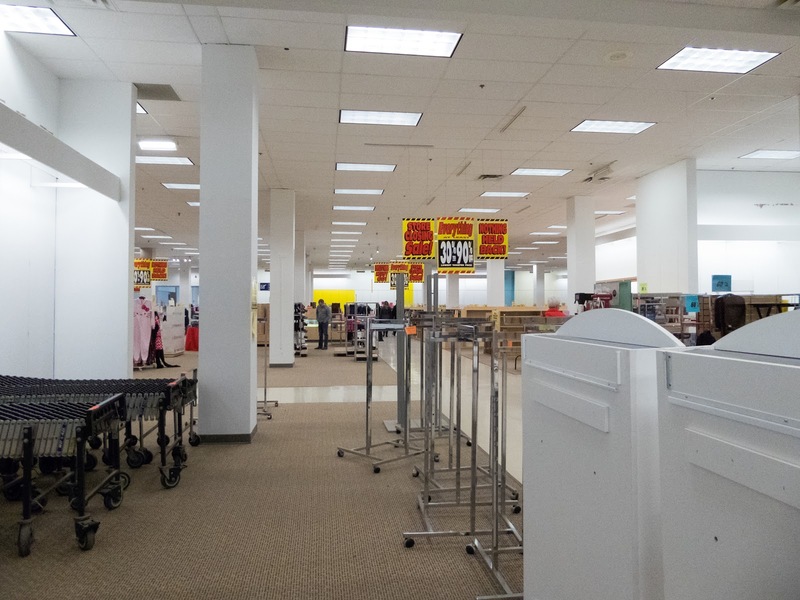 The sears store looked to be in better physical condition than Macy's.